We are often inclined to focus on God as the Creator of the Universe and as our personal protector and savior. During every age, however, God also enters human form to embody Perfect Love, Compassion, Humility and Divinity for all humankind. Those manifestations of God in human form inspire and gently remind us that Divinity exists within each of us and that it is both our potential and our destiny to one day attain that same, perfect union with God. 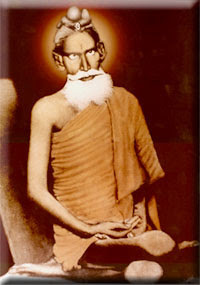 The world today is actively blessed by one of God's great Himalayan saints, Brahmarishi Baba Lokenath, who became God in Human Form after 80 years of yogic austerities. Baba Lokenath lived from 1730-1890. Such a life span, though difficult to grasp by the western mind, is not unheard of among great Yogis. As an Embodiment of Love, Baba Lokenath promises us, "Whenever you are in danger, whether in war, forest, ocean or jungle, remember Me. I shall save you. You may not know me. You may not realize who I am. Just pray to me with a little touch of your heart and I shall free you from gripping sorrows and miseries." Baba Lokenath calls to us, reaching across the distance of a century, to uplift every dimension of our lives. He reaches out to us with intense love and compassion. He extends an active and intervening hand of grace to heal our ills and personal deficiencies, however large or small, however tenacious they may seem, however hopeless we may feel about them. Mahayogi Avatar Baba Lokenath brings blessings of loving Light, wisdom, joy and harmony. I give glad thanks, and follow the Divine Seers Lamp of Aurum Lux Bhakti. Thank you for the wonderful blog and beautiful icon of Rishi Saint Baba Lokenath. a great superior avater baba loknath is our insparation in our daily life.he is god of univers, his blessing in our heart beat of life.joy baba loknath,joy baba loknath,joy baba loknath. joy baba loknath, baba loknath blessig our daily life insparation.om sri loknatha namah..om sri loknatha namah..om sri loknatha namah. Omnipresent compassionate,hears all the miseries and gives all the solutions...what would life be without HIS support. Parents give birth and bring you up in childhood but BABA leads you through the Jungle that life is ....embodiment of support. One of your son..lord almighty! I watched a movie on Sri Baba Lokenath on ETV Bangla today and was very much inclined to follow the easy principles whatever i could gather. Truly, He was, is a great Saint. Sonar Bangla has produced many great Souls, in which Baba Lokenath is one of them. May Baba Lokenath Bless us all. Joy Baba Lokonath,Joy ma Lokonath,Joy Shiva Lokonath,Joy Brahma Lokonath,Joy Guru Lokonath!!! Gurur Brahma, Gurur Vishnu, Gurur devo Maheshwara, Gurur sakshat parbrahm tasme shri Guruve Namah. A Guru is greater than God, Because he shows us path to meet God. We can not succeed in any field without a Guru. Wherever we are, Whatever we do, Our Baba Lokenath protects us from all evils. Baba Loknath is the savior of every human being. He has always saved me from all the dangers and all the problems I have faced in my life. He is the one. Always believe in Him and he will always save you from all the dangers. Baba gives me many things which are undefined from my lips. He is my gurudev. Everyone if you believe in him will definitely get success. Just call him a little from your heart everyday. He will enter in your heart and will give you everything. Baba you are my all. Bless me baba and be with me always. Baba Lokhnath is the mostly loving god for me from my childhood. In today's world we are standing on miseries and we should grab the hand of baba lokenath thus we could live with peace and became a true child of baba.